Beautiful, totally stunning, this gorgeous fully hallmarked Silver Gilded Brooch Pin is adorable. The two intertwined love hearts with the word Mother in Gold to the centre surrounded by an array of faceted cut diamante stones that sparkle exquisitely, it has a full Birmingham hallmark for Silver and the makers mark that I believe to be for Edwin Jones Birmingham Silversmith - measuring 2" inch long - Very nice it will not disapppoint and will certainly make a beautiful, timeless gift. This is a rare and special find, this beautiful art deco piece is huge! - set to Sterling Silver, it is in wonderful condition, it can be worn as a brooch or as a pendant, the picture depicts a crinoline lady, the colours are exquisite. Measuring c. 2.3/8" inch long (6.1cm), it is a very attractive original piece. Sure to delight collectors the world over - don't miss it!. 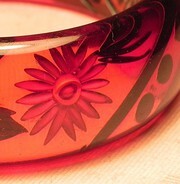 Fabulous, this substantial reverse carved deep clear red bakelite bangle is a real treat! - C.1940 it is in gorgeous condition - 100% guaranteed Bakelite (tested). This is a fine collectable piece in superb order that will delight collectors the world over.